Home › Personal Injury › Auto Accidents › Will you recover more if you hire a personal injury lawyer? Without an attorney, you are really at the mercy of the claims adjuster. Personal injury claimants with an attorney recover about 3.5 times more than injured parties that try to represent themselves. Personal injury claimants who consult with a personal injury lawyer recovered about 40% more than those who didn’t seek a legal consultation. 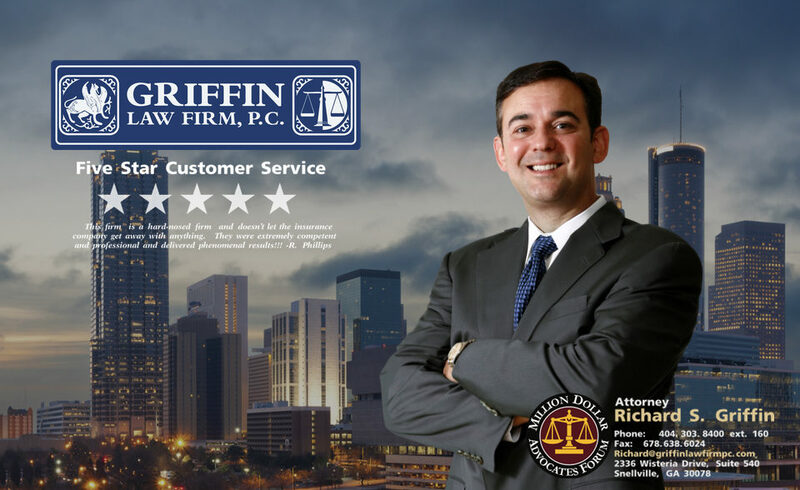 Why should you hire the Griffin Law Firm? Because Atlanta personal injury attorney Richard Griffin has created a team of legal professionals that deliver exceptional legal representation, outstanding customer service, and recoveries that fully compensate our clients for their personal injury, wrongful death, and workers’ compensation claims. How do you know we deliver on our slogan, “Good People. Great Results.”? You can use the below button to read our client reviews, our firm awards, and our settlements and verdicts for yourself. Free Personal Injury Consultation: Attorney Richard Griffin will also be glad to provide you a free consultation if you call 877-529-7070 or 877-PAIN-LAW.